Here’s looking at (or videoing) you, kid. 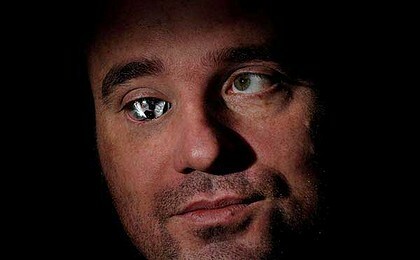 When Canadian filmmaker Rob Spence decided to have his badly damaged eye removed from its socket, he chose to replace it not with a prosthetic, but with a wireless camera. The decision, he says, was easy.”Every person I know who’s lost an eye immediately thinks, ‘I should think about getting a camera,’ ” he says. Although so far, Spence is the only person who has actually acted on the notion. How many people does he know who have lost an eye, I wonder? August 24, 2010 Posted by oldstersview | medicine, Strange	| camera in eye socket | Comments Off on Here’s looking at (or videoing) you, kid.